Self-growth is an incredibly natural thing. We all change and adapt as we move through life and as we age, and self-growth is something that will always coincide with the various experiences we have and the people that we meet. As much as I struggle with change, I love the idea that within a years time I can be a whole new person, with new strengths and new ideas and a different perspective to the one I have now. Whilst this natural change will always occur, I personally think it's important to take an active interest in self-growth, and pinpoint certain areas that we can focus on improving. I've definitely struggled with this in the past, and I think many people avoid actively working on it all together, because a lot of the time to change more positively as a person means to confront the parts that you believe are negative, or at the least something that you believe can be improved. Alongside this, you have the fact that self-growth is essentially a never ending journey. 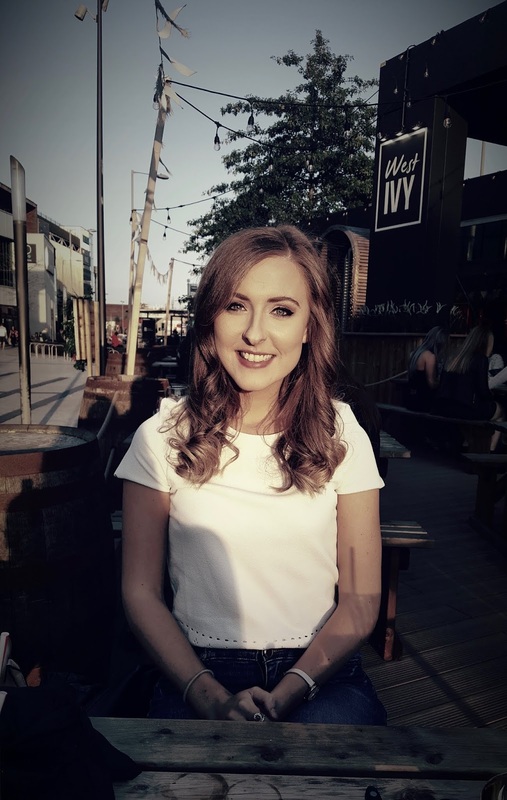 No one is a perfect example of a human being; we all have faults and we will probably never stop finding ways we can better ourselves, but I personally think it's important to aid our self-growth as much as we can, so today I thought I would share 5 things I'm trying to continuously work on! BE MINDFUL OF MY LANGUAGE... By this I don't mean that I currently swear like a trooper, I mean that I want to be more mindful of the every day language I use that could potentially be having a negative effect. I first noticed this at the end of last year when I was in the period between university and my new course. I wasn't doing anything official, most of my days were spent on the internet desperately trying to research and find something that I wanted to do, and I found myself constantly putting myself down when talking to friends. I wasn't even aware that I was doing it, but I was making it seem like I wasn't doing anything even though every single day I was up and making the effort to figure out what the heck I was going to pursue. Part of me believes this was partly due to the fact that nowadays a lot of people glorify being busy, and if you're not exhausted through the constant things you're doing then you're not doing enough. I wasn't and so I guess I pointed the finger at myself before anyone else could do it. I could talk a lot more about language and how easy it is to not realise we're using it in a damaging way, but I'll save that for another post. I would just like to be more mindful of the language I use and make sure it's positive as often as it can be! BE MORE OPEN-MINDED... I like to think I'm already quite an open-minded person as, for example, I try my hardest never to judge and to accept that people have different opinions to me. I don't believe that self-growth always has to be a drastic change, and so for this one I'd simply like to improve. I've noticed that I'm more open-minded when it comes to other people than I am to new experiences for myself. I'd like to work on not instantly seeing the fear or negatives of a situation that might be outside of my comfort zone, and not allow myself to dismiss certain things because I might have had a negative experience with them in the past. I want to be more positive and open in my approach to things. LESSEN MY SENTIMENTALITY... I think I've already improved on this drastically and now I'm working on finding the right balance. 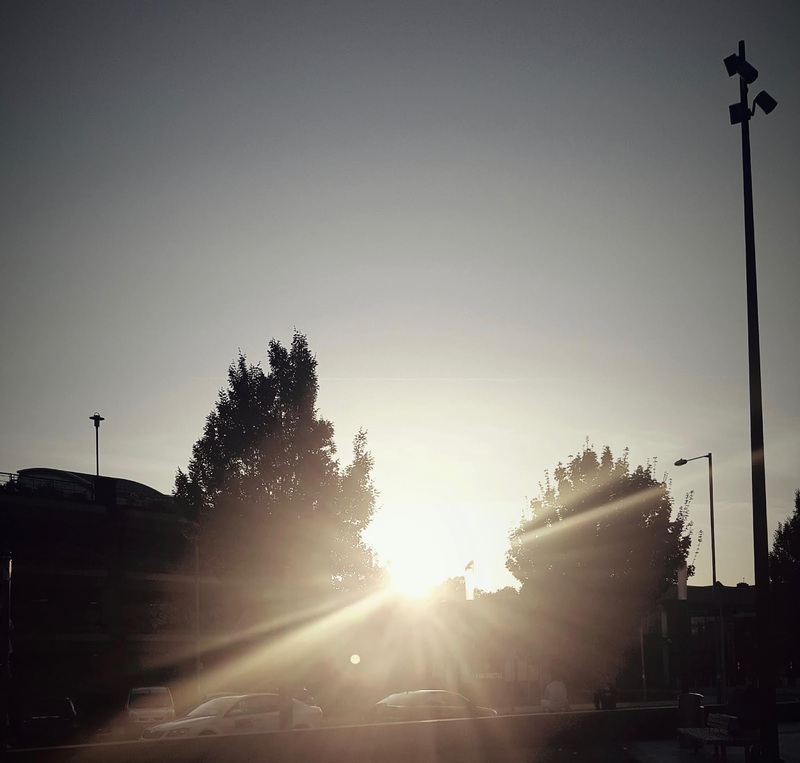 I love being a sentimental person and I think it can be a very positive thing for a lot of people, but for me personally it became far too domineering in a negative way. I find it so incredibly easy to assign sentiment to objects that it lead me to a point where it was affecting both my physical living space and my mental health. I've worked hard to change this, and one tip I discovered was to take a picture of something you find sentimental but do not want to physically keep. There have now been numerous times where months later I've deleted the picture because now that I have a clearer perspective I can remove the sentimentality where it's not justified, and increase the quality of sentimentality on the things that genuinely do matter to me. IMPROVE MY INDEPENDENCE... I've mentioned this previously in my Five Things I Learnt At 23 post, and to reiterate, I don't mean independence in terms of living *cleaning, cooking etc.*. I mean independence in terms of doing more things by myself, whether that's going to that yoga class even if my friend can't make it or trying not to panic when a lovely stranger starts to make an impromptu conversation with me. Improving my confidence in my independence will only improve how I live my life and the experiences I can have within it. BE MORE AWARE OF MYSELF... I feel like this one ties into another, much more difficult, area of not judging myself, but that's an area that will take far longer and much more work to improve. What I mean by this is that I want to be more aware of how I react to certain situations, how I genuinely feel about the things I spend my time doing, what things make me uncomfortable, how my body reacts to the food and exercise I give it, etc. I want to work on not simply barrelling through life thinking and acting a certain way because that's how I've been conditioned to think and act as I've grown up. How do I feel; what do I want; what does my gut tell me? 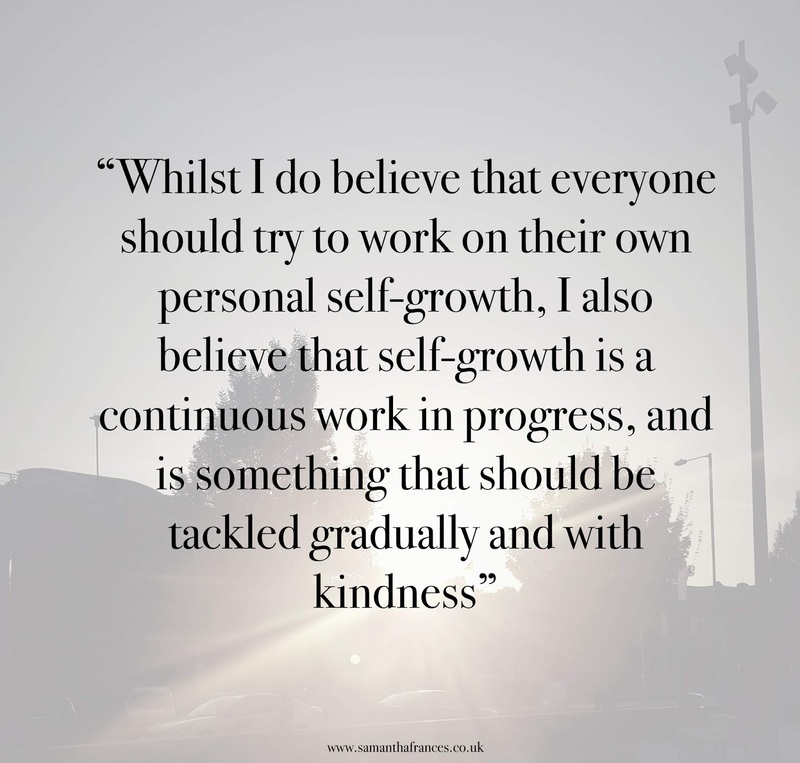 Whilst I do believe that everyone should try to work on their own personal self-growth, I also believe that it's a continuous work in progress, and is something that should be tackled gradually and with kindness. Writing down these areas I want to work on doesn't mean that by tomorrow I'm going to be perfect in each and every one of them; it simply allows me to identify the areas that are important for me to change and improve. Something that I recently discovered and have been loving is a podcast by the wonder woman that is Ella Grace Denton, called ReWilding. If you're interested in self-growth, women's issues such as body hair, periods, sexual liberation etc. then definitely give it a listen. There are so many creative ways we can aid and improve our self-growth and it's important to have fun while doing it! What are some aspects of self-growth you would like to focus on? Such an uplifting piece. Thank you so much for this! These are all such wonderful things sweetie, I think these are things that we could all do! I've actually really been working on improving my confidence and independence this year as well, particularly this past month and last week even. I'm finding it's making me feel so much more like I can handle anything, I'm really liking it so far. You are so right about current glorification of "busy." I had to take, what felt like pretty much a break from life to focus on my health and it drove me crazy! I constantly felt like I was on a verge of a nervous breakdown and realized that I just don't know how to rest or "take it easy." It's so important to remember that just because things slow down, it doesn't mean that your life, or self-growth is being put on hold. I totally get what you mean when talking about improving your independence. When I was younger my anxiety was so bad, I wasn't able to go anywhere alone- even to the bank or to get groceries. I know that it might seem a bit silly to some people, but it was a big problem for me. It's amazing what working on that can do for your confidence and I think that it's such a great goal you've set for yourself, Samantha. You are such a lovely person, I always love reading your posts and I wish you the best of luck with all your goals and self-growth!